Orissa is one of India’s least visited regions of the country, although it sits between two very populated states - West Bengal and Andhra Pradesh. It is bordered by the forested Eastern Ghats in the west, and a beautiful 500 km coastline of the Bay of Bengal in the east. Between this is the hinterland, a lush area of paddy fields with ancient temples and charming villages. The region has a tropical climate with copious rainfall - this makes for two rice crops per year. Like in other parts of the plains of Southern India, most people are engaged in cultivation and life revolves around planting-to-harvest cycles. The southwest hills are settled by tribal communities, descended from pre-Aryan aboriginal inhabitants. They rarely emerge from their home grounds and stay largely untouched from mainstream tourism. But it is still possible to stay in one or two comfortable guest houses in the region, and use them as a base to visit their fascinating weekly markets and have responsible time-bound interactions with villagers leading traditional lives. In the center and along the coast are the cities of Bhubaneswar, Cuttack and Puri, home to the stunning UNESCO recognised Konarak Sun Temple and some interesting artist and artisan communities. In the month of July or August, visit Puri for the crazy chariot festival of Jagannath, where a gigantic chariot is pulled by hundreds of volunteers (inspiring the word ‘juggernaut’). Along the coast, the Chilika Lake is home to rare freshwater dolphins seen by boat. Give yourself lots and lots of time for the rather unpredictable but highly rewarding annual arribada of Olive Ridley turtles. This is an equally rare natural phenomenon, unparalleled in the world, where thousands of turtles congregate along stretches of the coast to nest amass. Further north is the Bhitarkanika National Park, home to crocodiles and and thousands of nesting birds. Orissan is a favourite for more adventurous travellers, willing to take the rough with the comfortable. With an intricate history, fascinating tribal culture and natural beauty, it rewards those who make the effort. Shedding the image of being a place for raw adventure and tough travel, the North East is increasingly becoming accessible with better roads, more accommodation choices, and safe and exciting local experiences. Leading the charge is Assam, the biggest of the North East states that envelopes the east to west course of the mighty Brahmaputra. The river is the lifeblood of the region, its people and its wildlife. Picturesque paddy fields and manicured tea estates in Tezpur and Jorhat are set against the northern backdrop of the blue-white Eastern Himalayas of Arunachal Pradesh and in the south against the low-lying tropical forested hills of Meghalaya and Nagaland. In the west and in the east of Assam, are protected wilderness reserves of Manas and Kaziranga, where jeep and elephant safaris give you the closest to a big-game savannah experience across the floodplains of the Brahmaputra. Assam has an ancient animistic history of the Ahom kings and they left behind a distinctive cuisine with fiery flavours, a vibrant artistic and artisanal heritage, and some very unusual temples. One of the more unusual experiences is to visit Majuli, the world’s largest riverine island located in the Brahmaputra’s widest expanse. Its home to a monastic and artistic tradition unlike anywhere in the world. All of this and more can be experiences in a very unique way - on multi-day river cruises that traverse the course of the Brahmaputra. Beyond Assam in the farthest reaches of East India, obscured from the greater world by ageless forests and formidable mountain ranges, the Northeast States of Nagaland, Manipur, Meghalaya, and Arunachal Pradesh are one of Asia’s last great natural and anthropological sanctuaries. This is still a tough-to-travel region of rugged beauty, and a collision zone of tribal cultures, climates, landscapes and peoples. Birdwatchers head to Eaglenest, one of the world’s hotspots, the faithful make the arduous journey to the Buddhist monastery of Tawang, and the most adventurous travel far to the Hornbill Festival where former headhunters slowly embrace modernity in their ancestral longhouses in Nagaland. Of all of India’s big cities, perhaps Kolkata is its most characterful. As the former capital of British India, Kolkata retains a feast of colonial-era architecture contrasting starkly with urban slums and new age development. Various cultures and religious faiths have co-existed for centuries in little neighbourhoods making for very interesting walks. Food is a religion in the city, and there are several ways to experience their local cuisine - from home hosted dinners, street food walks, and even a cooking class. And it’s time to shed the ‘City Of Joy’ image that the world still largely holds of Kolkata. This 350-year old city is considered India’s capital for the intelligentsia, literati and artists. This is also the city of clubs, and a visit to one of the grand-old dames, makes for an interesting evening. On the street, people are warm and friendly, ready to help without expecting anything in return. Corner tea shops are a great place to chat with locals over a cup. This is a city that you feel in your bones - it takes you in and immerses you fully. Sultry West Bengal offers one of the most diverse experiences to any traveller to India. In the south, the Gangetic Delta empties into the Bay of Bengal. This gives rise to the mighty Sunderbans (beautiful forest) whose mangrove clad forests that are home to the stealth-like Bengal Tiger. As you travel north along the northern course of the Hooghly River with its ghostly colonial trading posts, the land rises up to tea estates and the British-era hill stations of Darjeeling and Kalimpong. Here are incredible views of the massive Khangchendzonga, one of the best preserved still-functional mountain railway lines, and some quaint tea estate bungalows to experience the lifestyle of the plantation. North of Darjeeling is the state of Sikkim, once its own independent mountain kingdom till 1975. It is nestled within the Eastern Himalayas bordered by Nepal on the west, Bhutan on the East and Tibet in the north. In the west, you can press your nose against the Kanchenjunga from well-chosen ridges in the early dawn. In the lower slopes of Pelling and Rinchenpong are forests of beautiful rhododendron and sub-tropical woodlands. This is an area for lovely gentle treks and camping on grassy meadows - a perfect family holiday. 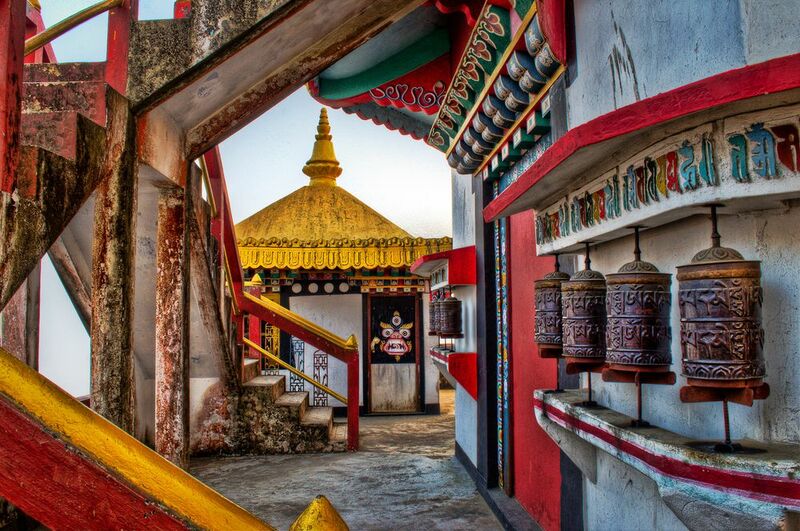 The monasteries of Pelling and Rumtek are filled with murals and a great place for meditation. This is a warm-hearted state, easy to fall in love with and difficult to leave. People are simple, been slow to give up their traditional livelihoods and yet very welcoming. You are also likely to be surprised by how clean Sikkim is! Two active weeks in the Eastern Himalayas offering a mix of monasteries, easy treks and walks, wildlife safaris, farm-stays, tea estates, and a delightful mountain railway - a perfect combination of unique experiences to share with your children in India.